Former England and Tottenham striker Jimmy Greaves is in intensive care after suffering a severe stroke. A statement from Greaves's family said the 75-year-old, who had a minor stroke in 2012, had been taken ill on Sunday. 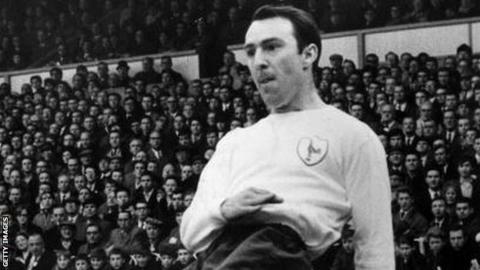 Greaves scored 44 goals in 57 England games and a club-record 220 league goals for Tottenham having started his career at Chelsea. "His wife Irene and four children have asked for privacy during what is a worrying time," added the statement. "Jimmy had a minor stroke in 2012, but appeared to have made a full recovery. "He was due to be inducted into the Tottenham Hotspur Hall of Fame on 13 May at a sell-out ceremony at White Hart Lane." Greaves is fourth on the list of all-time England goalscorers, behind Sir Bobby Charlton, Gary Lineker and Wayne Rooney. He was part of England's 1966 World Cup-winning squad but originally missed out on a medal because he was injured during the tournament's group stage. At the time, only the 11 winning players on the pitch at the end of the final received the award, although football's governing body Fifa changed that practice in 2007. The World Cup squad players and the families of team manager Sir Alf Ramsey and other backroom staff were finally presented with medals in 2009. Tottenham posted a message of support on their official Twitter feed shortly after the news of Greaves's stroke emerged. "Everyone at the club wishes Jimmy Greaves a speedy recovery after he suffered a stroke yesterday," the message read. "Our thoughts are with Jimmy and his family at this difficult time." Greaves scored 124 league goals for Chelsea, then a club record, between 1957 and 1961. Chelsea tweeted: "All at Chelsea are thinking of former Blue Jimmy Greaves and his family at this time. We wish him a full and swift recovery." England World Cup winner Sir Geoff Hurst, who scored a hat-trick in the 1966 final, said on Twitter: "Thinking of my friend and one of our greats this morning. Wishing him all the best and hoping for a speedy recovery." Hurst replaced Greaves in the England team in 1966 after he injured a shin against France during the group stages. Greaves helped Tottenham win the FA Cup in 1962 and 1967, while his career also included spells at AC Milan and West Ham United. In the 1980s he forged a new career as a football pundit on ITV, most notably alongside former Liverpool striker Ian St John on 'Saint and Greavsie', which ran from 1985 to 1992. Former Tottenham striker and BBC Match of the Day presenter Gary Lineker tweeted: "Choked to read that Jimmy Greaves has had a severe stroke. One of my absolute heroes. Thoughts are with him and his family. Get well, Jimmy."